Noa Lakshmi is an author, inspirational speaker, intuitive astrologer, yoga teacher, Self-Love master coach, lifestyle design specialist, and a guide for many. Her mission is dedicated to the transformational power of Love, especially Self-Love, which is the foundation of her work in the world. For over a decade, Noa has worked with hundreds of individuals, showing them how to cultivate the most loving relationship with themselves and experience profound healing in their body, mind, heart, and soul. 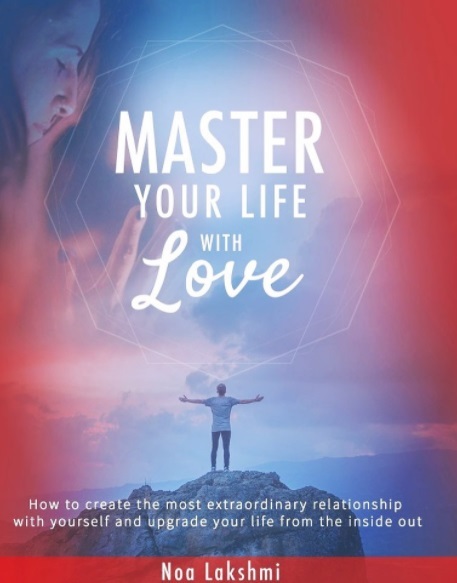 The publication of her first book, Master your Life with Love, represents a labor of Love designed to activate and unleash one’s full human potential. I know how to in-joy life to the fullest! I find the good in every situation and how to have fun no matter what I do. I am courageous. I stay true to my inner guidance and myself and I’m committed to always follow my true heart’s desires. I’m not afraid to follow my dreams and I NEVER limit myself to what is possible! Being myself and expressing myself honestly and authentically is my guiding light, regardless of others opinions or the status quo. To always live my life with a heart wide open. To express my inner artist through music, dance, acting and book writing. I’d like to produce a full musical album, a documentary film and a compelling show that combines dancing and acting. To create communities all over the world, communities that are based on integrity and love for oneself, love for one another, love for the Earth, and love for all of life. To continue evolve and become the best version of myself. To be a leader that inspires and creates radical change through the power of love. To become a bestseller author with the book I just published – ‘Master your Life with Love’ and to be picked up by a large publishing company. To refine and expand my group programs and have more people come on board on a regular basis. For my business to be prosperous and an abundant source of financial flow in my life. To speak in front of large groups of people. To be interviewed by Oprah. To build a community of individuals who follow my work and are inspired to master their lives with love. To start train other teachers, leaders and change agents. To co-create programs, classes and enterprises with my beloved partner and reach a larger audience. Since this is very recent, the publishing of my first book is definitely one of the biggest and greatest accomplishments of my life! It was truly a labor of love I am extremely proud of. I never saw myself as an author so I think I’ll be forever in awe of my capabilities and dedication. Another success I feel very proud of is the relationship I have with myself today in comparison to what it used to be like in the past. I’ve come a VERY long way and I do feel like I’m a completely different person who’s living a very different life. That to me is a huge accomplishment. Deciding to end my marriage 7 years ago. We had a very beautiful and loving relationship and he was a beautiful person, yet I knew that staying married to him wasn’t in the highest for neither of us. I’m not proud of the way I ended it but I know that decision, as difficult as it was in the moment, was indeed impactful and changed the course of both of our lives forever. 2. What would love do now? I like to use only natural products and I’m always happy to find new brands that have high standards and quality. I also make my own stuff at home using natural, food based ingredients. I love my ‘Sacred Rebels’ card deck and my little Ganash statue I carry with me. My book is definitely a huge passion of mine right now! It is my baby and I love taking care of it. I’m passionate about sharing that body of work with the world. I’m very excited about my blossoming relationship with my Soul mate… We’ve known each other for a few years and now we are weaving our lives together in the most magical way. I’m enjoying that immensely and excited for everything we are creating together. I’m passionate about my creative expression and all that I feel inspired to share through my body and my voice. The next couple of years are going to be dedicated to that. I feel passionate about spreading the message of radical self-love with as many people as possible. I’m passionate about the ancient wisdom of astrology and excited to continue doing readings with amazing individuals from all over the world. I’m passionate and excited about Life! These are exciting times to be alive and I’m grateful and eager to play my part.